Since 1987, representative Police Football Teams from South Australia (Hounds), Victoria (Big V), Western Australia (Hogs) and Tasmania (Devils) have fought it out for the Championship cup, with Queensland (Crocs) and New South Wales (Blue Heelers) joining the competition in 2004 and 2005 respectively. Now, six State Police Football Teams have forged a close bond to compete for the Championship Cup each year. But it is not all about winning. Many of the games are played in honour of police officers who have made the ultimate sacrifice while serving on duty. The following memorial trophies / shields are represented when the respective teams play each other. Memorial speeches and moments of silence are observed during the Championship in memory of all police officers who have been killed. Policing is a difficult and fearful job and only those made ‘of the right stuff’ need apply. The ‘brand’ of footy played during the Championship is reflective of the attitude of the police that play in them. Many APFA players have also played in AFL, SANFL, WAFL, VFL sides and their skill and passion shine through. 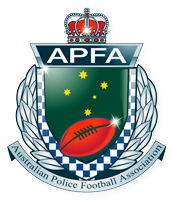 For details of the next National Police Football Championship or to enquire about sponsorship please contact Sergeant Zac Cook, Director APFA on (08) 8207 6666. In addition, the National Police Memorial in Canberra has a website which provides details about all the police who have died while on duty or as a result of their duties. The ‘Honour Roll’ includes profiles on each of the police officers for whom memorial trophies and shields have been inaugurated. Visit http://www.npm.org.au/home to read their stories.